Chronic stress. This is stress that lasts for a longer period of time. You may have chronic stress if you have money problems, an unhappy marriage, or trouble at work. 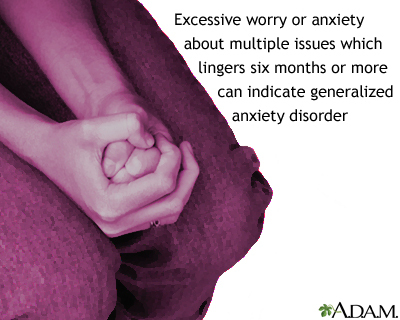 Any type of stress that goes on for weeks or months is chronic stress. You can become so used to chronic stress that you don't realize it is a problem. If you don't find ways to manage stress , it may lead to health problems. Your provider may refer you to a mental health care provider. You can talk to this professional about your feelings, what seems to make your stress better or worse, and why you think you are having this problem. Ahmed SM, Hershberger PJ, Lemkau JP. Psychosocial influences on health. In: Rakel RE, Rakel DP. eds. Textbook of Family Medicine. 9th ed. Philadelphia, PA: Elsevier Saunders; 2016:chap 3. National Institute of Mental Health. 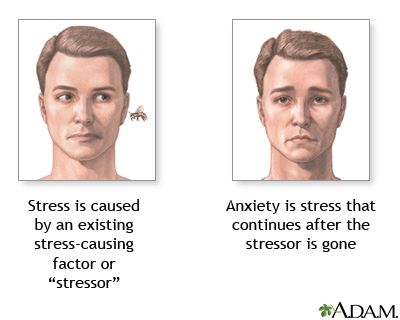 Fact sheet on stress. www.nimh.nih.gov/health/publications/stress/index.shtml . Accessed November 3, 2016. Vaccarino V, Bremner JD. Psychiatric and behavioral aspects of cardiovascular disease. In: Mann DL, Zipes DP, Libby P, Bonow RO, Braunwald E, eds. Braunwald's Heart Disease: A Textbook of Cardiovascular Medicine. 10th ed. Philadelphia, PA: Elsevier Saunders; 2015:chap 86. Do you have trouble falling asleep at night? Or, do you go to sleep, only to wake up a few hours later and stay awake for hours at night? Well, let’s today talk about insomnia. Your sleep-wake cycle is a delicate pattern run by something called circadian rhythms. These rhythms are physical, mental, and behavioral changes in your brain that roughly follow a 24-hour cycle. Your daily and nightly habits, many you learned as a child, may affect your circadian rhythms and how well you sleep at night. Poor sleep or lifestyle habits that may cause insomnia include going to bed at different times each night, daytime napping, and a poor sleeping environment such as too much noise or light. Spending too much in time in bed while you’re awake can change your sleep patterns too. Likewise, working evenings or night shifts and not getting enough exercise can affect your sleep. People who use alcohol or recreational drugs may have trouble sleeping. Heavy smoking and drinking too much caffeine can also cause insomnia. And, even using some types of sleep medications a lot can cause you to lose sleep. Medical problems can cause insomnia too. People with anxiety disorders, bipolar disorder, thyroid disease, depression, and chronic pain problems may have trouble going to sleep or staying asleep. So, what do you do about insomnia? Well, it’s important to remember that not everyone needs 8 hours of sleep every night. Some people do just fine on 6 hours of sleep, while others need much more. If you need more sleep, your doctor will probably ask about any medications you’re taking, your drug or alcohol use, and your medical history. Spend some time thinking about your lifestyle and sleep habits. It’s best to avoid caffeine and alcohol at night. If you don’t exercise, starting regular exercise might help you sleep better. If you’re depressed or anxious, talk to your doctor to see if relaxation techniques can help, if medication might be helpful, or if seeing a mental health provider is best. If you’re suffering from bouts of insomnia, take heart. Most people can return to more normal sleep patterns when they make simple changes in their lifestyle or habits.